Please refer to our stock # TZ10042 when inquiring. 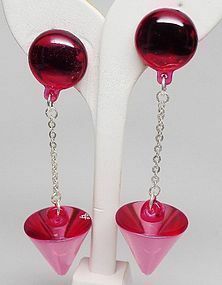 These earrings are absolutely stunning - they are clips - 4" long. There is a button on the ear, a long silver chain, with a large 1" cone at the end. They come in all of the colors of cones on the multi-colored cone necklace and bracelet, which you can see in the listings of those items. I have them in three colors - green, blue,and lavender @ $60 each. They are brand new, never worn. For the uninitiated, Sobral was relatively unknown until about four years ago when Karl Lagerfeld choose Jackie Brazil to design the jewelry for his Paris runway shows. Since that time, his jewelry has been sold in select boutiques in France, England, and the United States among other countries. It is all hand made of recycled materials. Be sure to indicate which color you prefer when ordering. I have received a new order, so I have the blue and purple earrings back again, as well as new yellow ones which I will photograph and show soon.